Sometimes I find books by putzing around on Amazon . . . my latest comes from putzing around a library. I roamed the shelves and picked up a copy of What If? by Randall Munroe and a 1963 biography of Lawrence of Arabia. Dare you to find another website that mentions the two of those together. I enjoy reading history books for some reason and even more so, those from previous times because you can also learn about the biases of the the time when the pick was written as opposed to those of your own time which are already well known. Older books are closer in time to the event they describe and apt to be more accurate (I’m willing to be proven wrong). By looking in the past, you can also become aware of current biases you didn’t even realize were so. Science magazines are just as fun this way. Here’s were the relevance to the blog comes in – the Jewish part. Okay, soon. 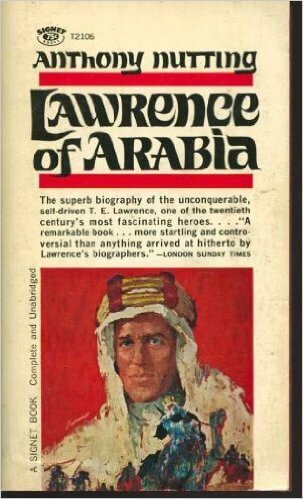 Lawrence, who liked to dress in Arab clothing even at meetings with his commanders, fought alongside Feisel I of Iraq. After the Ottoman Turks were ousted at the end of WWI (1918), Lawrence’s plan was to install Feisel as king over the lands stretching from Syria to Iraq. After the war, however, the Arabs looked askance at Feisel who cooperated with the British colonial powers and Feisel, for his part, would have little further to do with Lawrence who returned to England distraught over a battle fought for independence only to place the area under different colonists. Feisel and Lawrence welcome Jews to Israel (“we will wish the Jews a most hearty welcome home”) though as part of an undivided pan-Arab nation extending through the Middle East. Meanwhile, the French take over the area which is now known as Syria and defend it vigorously. The British partition their land into Palestine, Transjordan, and Iraq. Mosul, with oil fields, goes to the British after much lobbying and jockeying with the French. The locals in Iraq cause enough trouble that it costs the British taxpayers more to maintain it than it did the prior war so it goes to Feisel as consultation for being kicked out of Damascus. British policy is in disarray with different branches promising different things, and a march from Iraq to out the French stops in Transjordan, a mostly nothing desert in comparison since the times of the Second Temple when Jews bypassed it for modern day Iraq (“Bavel”). The British governor, not knowing what to do, welcomes the Hashemites and they decide to take over that area instead of fight the French in Syria. Until ISIS, the imposed borders remain, albeit with local rules. Democracy? Unheard of. a) There are Arabs, then as now, who are just fine with a large Jewish presence in Israel, albeit, they are very adverse to a long history and feeling of being ‘colonized’ or made to feel second class. b) Arabs stink at forming armies (paraphrasing pages and pages of Lawrence’s biographer). They excel only at what we call today “terrorist” tactics and only when they see victory in the first instance. At the first counter attack, they generally scatter in fear. This was true when fighting the Turks and most of the Israeli-Arab wars. c) Arab arms come from foreign suppliers who, in turn, seek influence. Homegrown ingenuity doesn’t seem to be their strength. d) There are no easy solutions. The past should have and could have been played out differently. While I agree that is is moral and that we most stop atrocities wherever they are, in a “regular war” or conflict, in my opinion, the world should leave well enough alone and let regions tend to their own affairs. Just as sending free shoes to poor countries actually inhibits growth according to many, fighting the battles of others keeps them weak. imagine Jews returning to the land in the same or even larger numbers. This, actually echoes the Satmar Rebbe‘s arguments that nation seeking resulted in more Jewish deaths by turning the world against us. There are a lot of moving and complex parts to all of this IMHO to draw such a conclusion. Yet for today, while ceding power in Israel would be a terrible idea for everyone (it’s the pillar stability as well as both technological and spiritual advance in the world), we can try and let the Arab world work through it’s own battles so it can calm down after hundreds of years of anger at outsiders.